Questar III BOCES delivers more than 275 educational and administrative services to 23 school districts in Rensselaer, Columbia, and Greene counties. 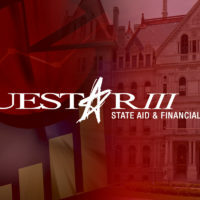 Questar III also provides statewide services to more than 640 school districts in New York. BOCES services are created when 2 or more districts have similar needs that can be met by sharing staff members, classroom/office space, equipment, time or expertise. Questar III provides hands-on learning from pre-kindergarten to adult learning. It also provides affordable management and administrative services ranging from grant writing to financial planning.